Use Case: You often have situation where for marketing and analytics purpose you have to reply on dev team to push tracking code or tag management code or inclusion of any third party client side library. Satellite Search and Discovery provide great way to abstract client side tracking or tagging changes for marketing and analytics with development. 1) Update to CQ could happen out side dev cycle. For this make sure that satellite changes are completely tested before using it in production. 2) Since Satellite is similar to SAS service, changes in satellite could also cause some module not to work as expected. For that you can keep track of changes in satellite side and test that module. 3) Some time satellite load is slow if it is loaded from there hosted service. For this you can host satellite code on dispatcher and use some script to update it every time there is any change. you can also use run mode specific configuration to include dev or prod specific script to your side. For performance you can host satellite on dispatcher itself and then include it in your file. For this satellite provide a feature for deploy Hook. 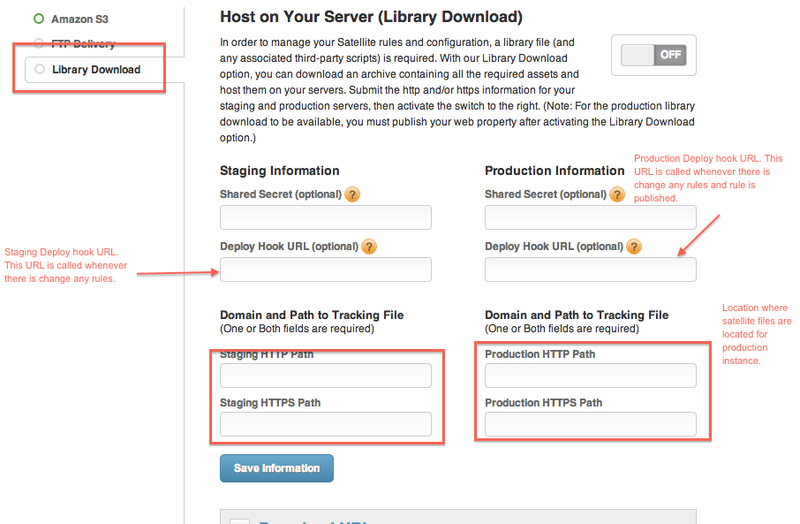 Deploy hook URL is called every time there is a change in any configuration or any rules are published. 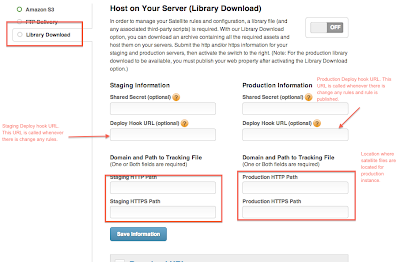 If you want to host satellite files on dispatcher then you can give this deploy hook URL as your production server URL path that you want to call every time there is any change. For example I want call a servlet or any script on change and update change in dispatcher and all other publish and author instance. After that it issue tree activation request to update these files on all publish. (This step is required in case some one clear dispatcher cache). In order to avoid infinite loop within all dispatchers, one dispatcher call other dispatcher with a URL param indicating not to call other dispatcher. for UID:PWD you can use non admin users that only have access to satellite files, make sure that they have activation rights as well. Note: I am using old version of python, You can reduce code with latest version. #This folder path is required to avoid permission issue. #Need to create rewrite mapping for this to work. staging_satellite_url="THIS IS THE URL WHERE DEV SATELLITE FILE IS HOSTED"
production_satellite_url="THIS IS THE URL WHERE PROD SATELLITE FILE IS HOSTED"
author_content_folder="FOLDER NAME WHERE YOU WANT THIS FILE TO GO"
author_content_subfolder="SUBFOLDER NAME GIVEN BY SATELLITE /"
satellite_js_file_name="SATELLITE FILE NAME GIVEN BY SATELLITE"
Happy tagging and tracking. Let me know if you have any question. Note: Please note that there could be other tools that are capable of doing similar things. You can use similar approach there as well. This post has no mean to say that you should use satellite search and discovery for similar use case.